OK OK I Get the Message! I just realized today that I need to take the rest of the year off. Yesterday I was preparing to contact the owner of the above pictured almost-completed dappled chestnut “Boreas”. 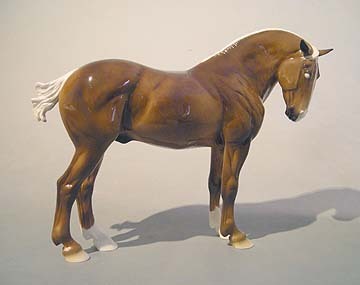 I looked up the commission details only to discover that this guy was supposed to be dark flaxen chestnut PINTO!! I can’t believe I totally forgot to do the pinto markings. Now I have to email the owner and see if she wants him non-pinto. If not, I have to start over and also find a buyer for this one. I was supposed to get another china commission finished this month, and it isn’t even started. In fact I had several goals to complete by the end of this year which didn’t get done. I have to finally admit that I have been so distracted these last couple months! I think I am already over in England in my mind and I’ve been dropping the ball on other more immediate stuff! So, I have declared a moratorium on accomplishing anything important through Dec 31st, and it might just extend until we get Paul on the plane the 2nd week of January. I have to think hard in the next little while about how much china commission work I should realistically take on before May. I am already feeling pressured with what I have on the books and that is a guaranteed joy-killer when it comes to painting. And I need to finish the two sculptures I have started, to take to England where I can get them molded for ceramics. That is a MUST. I’m flying to upstate NY tomorrow (maybe, that is… the weather is NOT forecast to be very good in the northeast). I will be forced not do anything but get my head back on straight for the next 4 days which will be a good thing!